Hurricane Harvey: A Wake-Up Call That We Are Much More Alike Than Different. And That Our Natural Instinct Is To Reach Out And Support Others. Tell me, why does it always seem to take a raw, devastating and life-shattering event, such as 9/11 or Hurricane Harvey, to bring us to a higher consciousness? I think it's time we all took a break from the anger, fighting, and horrendous violence that's been going on not only in America, but all over the world, and instead focus our attention on the realization that we are much more alike than different, and that our natural instinct is to reach out and support one another. Other than watching updates on Hurricane Harvey, I have pulled myself away from watching the news because I can no longer bear to expose myself to the pathetically heartless media (on both sides) that do nothing but focus on negativity, which fuels and perpetuates the anger, fighting and horrendous violence, merely for the purpose of getting higher ratings. The media are like greedy, attention-seeking whores, turning tricks to get the most favors. Two evenings ago, I sat in front of my computer monitor with a glass of red wine and balled my eyes out as I looked at these photographs I'm about to share with you. 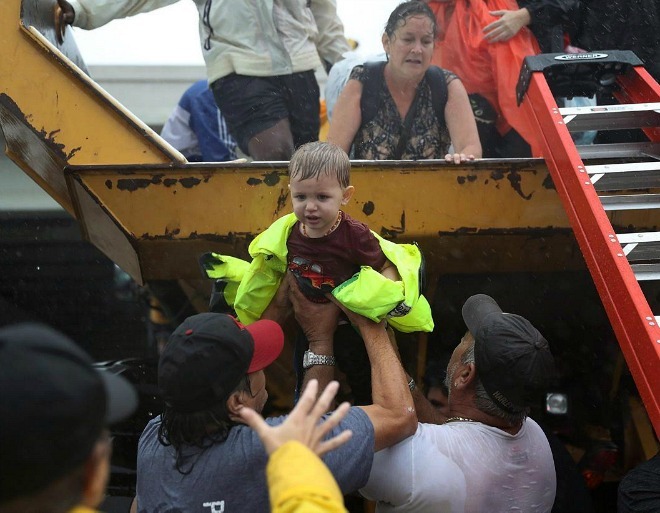 And it wasn't only because of the tremendous sadness and heartache I felt for the people of Texas and their losses, but also because of the tremendous outpour of concern, compassion, and love from all the people who immediately came to the assistance of Texas and did anything and everything they could to lend their support. You see, THIS is reality. Not the crap we're forced to watch about how different and more superior we are to each other because of our race, religion, gender, etc. Hurricane Harvey is a HUGE wake-up call. In a situation like this, it brings us together, proving that we are all on the same level. our media coverage is the same as yours, and pray that those people will get through without too much heartbreak. How can that be, though, when homes are lost as well as the contents in them. I agree with you that the world is a crazy place now. What brings on such violence for apparently no reason? I wonder about the media, if it has gone too far in so-called reporting of events, films etc. But that has got nothing to do with floods; they come about because we have interfered with nature. Ron, what a powerful post! And I agree with every word you said. I have have stopped watching the news because I can't stand all the childish bickering, it's exhausting! You're right, why does it take a catastrophe to bring people together and realize how much we have in common? Thank you for sharing this today, Ron. I think it needed to be said.
" doing stuff only when horrible things happen or when the calendar dictates is not genuine and from the heart to me. it's like people put on another personality and then take it off after the event passes. that's why it doesn't stick and we go back to being arseholes." Thank you sharing that, Valerie, because I was going to add something to this post (but forgot) about how after a devastating event happens, we eventually seem go back to being how we were and forget. Yup, you're absolutely right! Thanks a lot for stopping by and sharing your thoughts and feelings, my friend. Have a great weekend! That last picture brought tears to my eyes as well, Valerie. It's so touching. 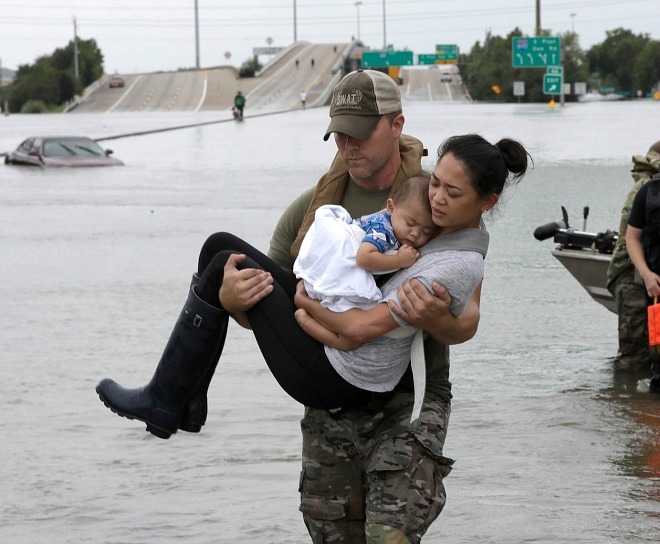 And the other picture that really hits me hard is the one of the man carrying the woman and her sleeping baby across the water. OMG...that rips me apart. "How can that be, though, when homes are lost as well as the contents in them." You are right. And it's going to take a LONG time to repair and regroup. I can't even imagine what it must be like to lose your home. "I wonder about the media, if it has gone too far in so-called reporting of events, films etc. But that has got nothing to do with floods; they come about because we have interfered with nature." 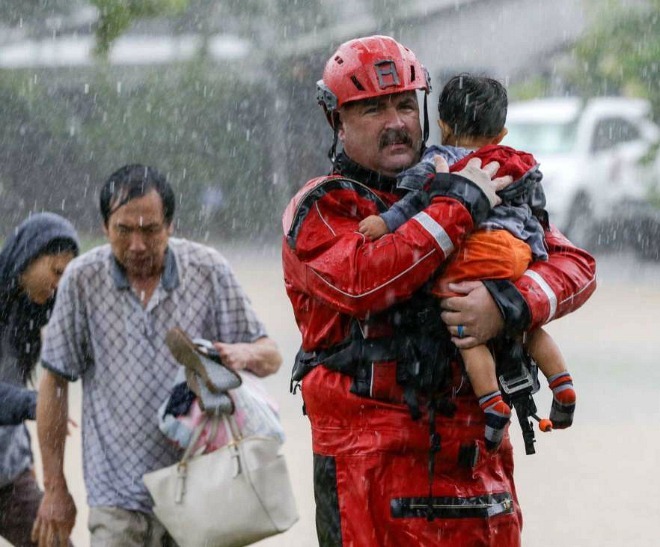 What upset me the most about the media when it came to reporting the events of Hurricane Harvey is that MANY of the reporters who were interviewing the people of Texas were merely there to GET A STORY; shoving television microphones into the faces and asking certain questions, just to get "emotion" out of the person they were interviewing. I found it so manipulative and heartless. "I have have stopped watching the news because I can't stand all the childish bickering, it's exhausting!" I've been wanting to sharing my thoughts and feelings about Hurricane Harvey (and ALSO the media) for awhile now. Ron, just the other evening my husband and I were discussing this same topic. It's breaks my heart to see the devastation of Harvey. God knows how long it will take the state to restore the areas most affected. Something like this shows us just how sudden your life can change and how fragile life is. I was still living in New York at that time of 9/11, thinking our city would never recoup. But with the help of so many others who came to our aid, we did. You're so right, why does it take a life shattering event to make us realize that we need one another and that we're not very different than each other. Thanks for sharing this, Ron. Those pictures are humbling indeed! "The media are like greedy, attention-seeking whores, turning tricks to get the most favors." Ron, I loved that. And I couldn't have expressed it any better if I tried. That's exactly how I feel! My girlfriend has a few family members who live in Texas, so we were on pins and needles about where Harvey was headed and what it would do, never thinking it would be as bad as it was. Thankfully, her family was not affected. I agree, this catastrophe was a huge awakening. Hopefully it will alter America's consciousness into seeing what is REALLY important and what is NOT. Thank you for posting this, dude! Yes, I vented a bit about the media, didn't I? HAHA! It's just that I've been so sick and tired of watching the media throw more wood into the fire, to make their side of the story more dramatic. But as I said, it's both sides that are doing it. It's like watching two children scream and fight with each other. 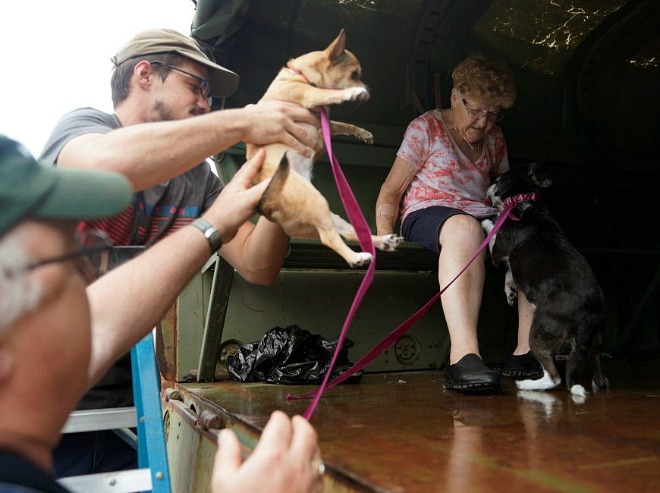 "My girlfriend has a few family members who live in Texas, so we were on pins and needles about where Harvey was headed and what it would do, never thinking it would be as bad as it was. Thankfully, her family was not affected." OMG, I bet you were so relived to hear that. I have a close friend in Florida whose husband's family is from San Antonio, and they too were not affected. I spoke (texted) my friend right after Harvey hit Texas because I was very worried. "Hopefully it will alter America's consciousness into seeing what is REALLY important and what is NOT." Thanks so much for stopping by, buddy. Hope you're having a great weekend. Happy Labor Day to you and your girlfriend! I think it's going to take a very long time to rebuild the areas that were affected because it was so severe. Water damage (like what occurred with Harvey) is EXTREMELY destructive. Yes, doesn't something like this show us just how fragile life is? Our lives can suddenly change in the blink of an eye. "I was still living in New York at that time of 9/11, thinking our city would never recoup. But with the help of so many others who came to our aid, we did." OMG...it was so moving to see how many people from all over the world came to the rescue of New York on 9/11. I will even now, sometimes look at photographs from 2001 of that tragic event and get very emotional. Thank you, Ron. Incredible photos that are all new ones to me. I often think that the helpers get more out of helping than the ones they are assisting! It's wonderful to see people caring for each other, instead of worrying about what side of the political spectrum they fall. Kudos to those who come together in the name of peace. LOVED your comment, my friend!
" It's wonderful to see people caring for each other, instead of worrying about what side of the political spectrum they fall. Kudos to those who come together in the name of peace." These photographs touch me to the core. The one that moves me to tears the most is the one of the man carrying the woman and her sleeping child through the water. OMG...rips my heart out. Thanks so much for stopping by and for sharing your thoughts and feelings. Hope you're having a super weekend! Tragedy does bring us together. I was across the street from the Trade Center when the planes hit on 9/11 and during the long, terrible walk home, I ran into people who were doing incredible things: giving out bottles of water, letting people borrow their cell phones--one man was picking people up in his van and dropping them off. It was an amazing, beautiful response. If only that feeling could last beyond the tragedy. Thank you SO MUCH for sharing that story! I remember when you first posted about 9/11 on your blog and being so moved by what you went through on that day. And then I remember when Val and I came into the city several years ago and you walked us to the spot where you actually stood on that day and told us what you experienced. "It was an amazing, beautiful response. If only that feeling could last beyond the tragedy." Hope you're having a great weekend. And thanks so much for stopping by! Thank you, Ron, for saying so well what LOTS of us have been thinking! Yes, it's humbling to realize that any one of us could have been on the receiving end of the support and love the hurricane victims in Texas needed. None of us knows when (or where) the next disaster will strike. And I think it's obvious that, left to our own devices, most of us are quick to lend a hand, to donate time and treasure, to volunteer. I wonder what it's going to take for us to celebrate our likenesses -- and differences -- rather than blindly accepting the media's take on situations. Some of those so-called journalists make me ashamed of my profession! Perhaps we've all been lulled into blindly believing the things they say, rather than holding them to higher standards. For sure, some of the reporting I've seen is FAR off from the ethics I learned. Thank you for a thought-provoking post today -- enjoy your day off ??!! Yes, you're so right, Mark! 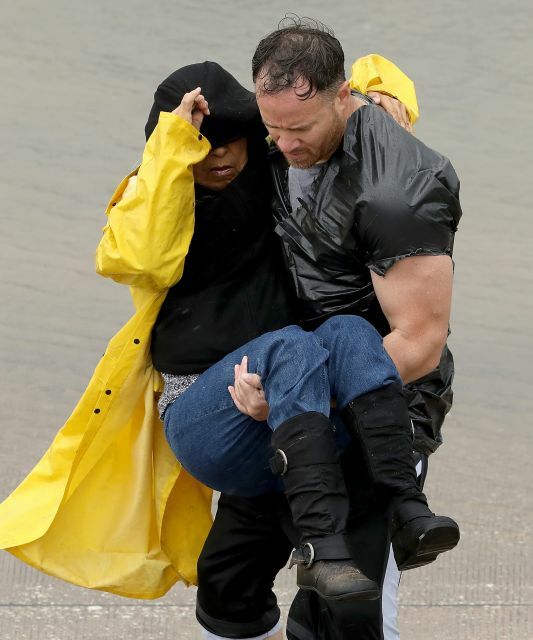 These photos show the best of HUMANITY! Perfect way of putting it! I agree, why can't we all just get along? I think this hurricane was a huge reminder to us that we need to change our perception. Thanks so much for stopping by and sharing your input on this topic, my friend! Hope you're having a great Labor Day weekend as well! Just stopped back to wish you a Happy Labor Day, Ron! Thank you Elaine! Happy Labor Day to you too! It'll be a short day at work for me. We're only opened part of the day. Ron, I want to join in on what Debbie said and say thank you for saying what so MANY of us are thinking. Such a well written post! I'm over the media, on both sides, who do nothing but spew venom back and forth to each other. I'm so sick of the news. Hurricane Harvey was devastating. And it will take so much time for the people of Texas to regain all that they lost. I can't imagine what it must have been like to go through this. The photographs you shared cut right to the core of our human nature, to reach out and help each other without any thought of difference. You hit the nail on the head when you said, "In a situation like this, it brings us together, proving that we are all on the same level." I'm very worried about the state of the world right now. I agree with you that this hurricane was a wake up call to take notice. Thanks a lot for sharing this, Ron. X Hope you had a wonderful Labor Day! I'm with you, Ron! The media have a lot of blame when it comes to stirring up bad emotions. Thank you for this positivity, my friend. "The media have a lot of blame when it comes to stirring up bad emotions." Yes, it's like they keep throwing firewood into the fire; creating more bad emotions. Thanks so much for stopping by, my friend. Have a fantastic week!!! I completely agree. It seems we, as a nation, are at our best when faced with disasters of this magnitude. Harvey and the Pacific Northwest fires are only two events that have reminded us of our humanity and brought people of all races and creeds together. The photos you've shared display that wonderfully. And, now, hurricane Irma is bearing down on Florida and the Caribbean islands as a category 5 storm. The devastation will be catastrophic, whatever path it takes. I'm also sick of how the media whips up controversy. When I watch the news, the song Dirty Laundry always runs through my mind now. I don't believe we're as polarized as the media would like us to believe. Yes, we have serious issues, and I hope and pray saner, more reasonable people will rise up and be heard above the childish temper tantrums of others. Take care and we well. "When I watch the news, the song Dirty Laundry always runs through my mind now." Lisa, I LOVED that because you're absolutely right....it IS like dirty laundry!!! 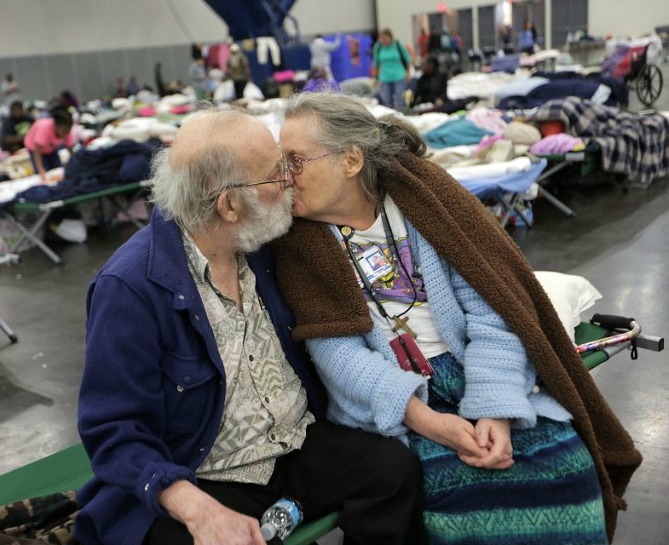 "Harvey and the Pacific Northwest fires are only two events that have reminded us of our humanity and brought people of all races and creeds together. " Yes, isn't that something? In times such as these, none of that matters, except our natural instinct to reach out and help others, regardless of their race or creed. Yes, I've been following the weather on Hurricane Irma because I have family and friend who live in Florida, therefore I am very concerned for them. And yes, I too believe that we are not as polarized as the media would like us to believe. And Hurricane Harvey proved that. Thanks so much for stopping by and sharing your thoughts and insight, my friend. You've added much. Hope you're having a super week! And Happy Belated Labor Day to you and your family! I totally agree with every single thing you said in this post Ron. 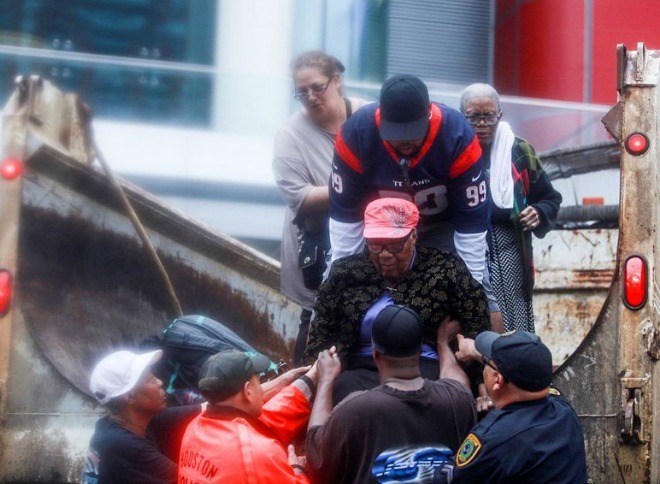 Hurricane Harvey brought such devastation...but it also brought the American Spirit! I, too, have stopped watching the news...for the most part. It is so insanely negative and most of the time one-sided. It drives me nuts. It is depressing. It just gives me a headache. There is WAY too much violence. And now...we are looking at another hurricane. 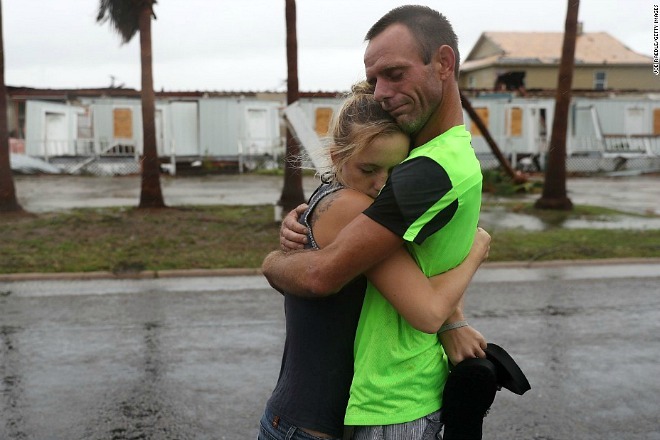 Let's hope Florida survives ok. Hope all is well with you, my friend!
" 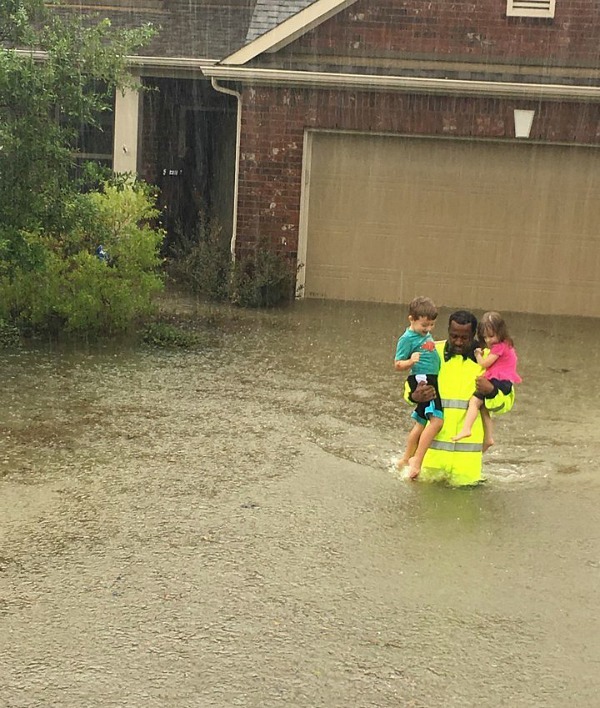 Hurricane Harvey brought such devastation...but it also brought the American Spirit! " Jeanne, I LOVE how you expressed that because you're spot on....it reignited the American Spirit! "It is so insanely negative and most of the time one-sided. It drives me nuts. It is depressing. It just gives me a headache." Yes, to all of that! Lately, I've been tuning in just to see what's happening with all the hurricanes we're getting this season. It's like one after the other. I'm really concerned about Irma because I have family and friends in Florida. Thanks so much for stopping by and sharing your thoughts and feelings on this topic, my friend. Thank you! X to you and the doggies! Heart-touching post, Ron! And I shared your thoughts, feelings and sentiment. Why does it take a tragedy to make people see what's really important? "Why does it take a tragedy to make people see what's really important?" Thanks so much for stopping by and sharing your insight, buddy! 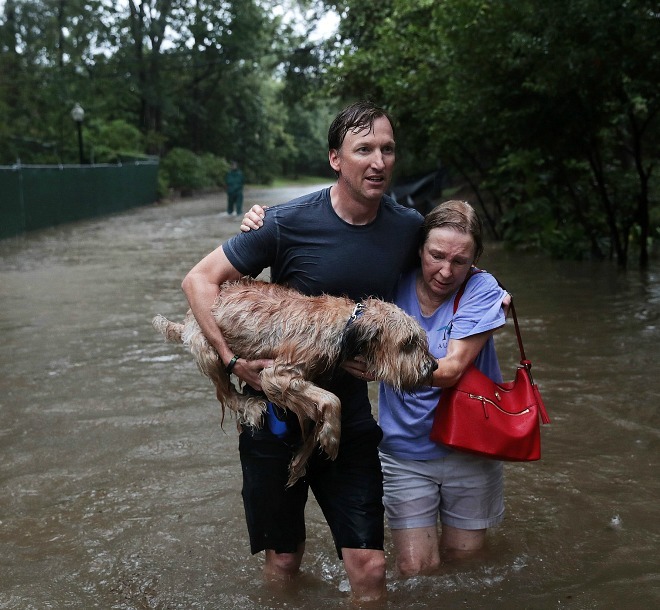 It's heartbreaking to see the photos, seeing what people are going through with these storms. 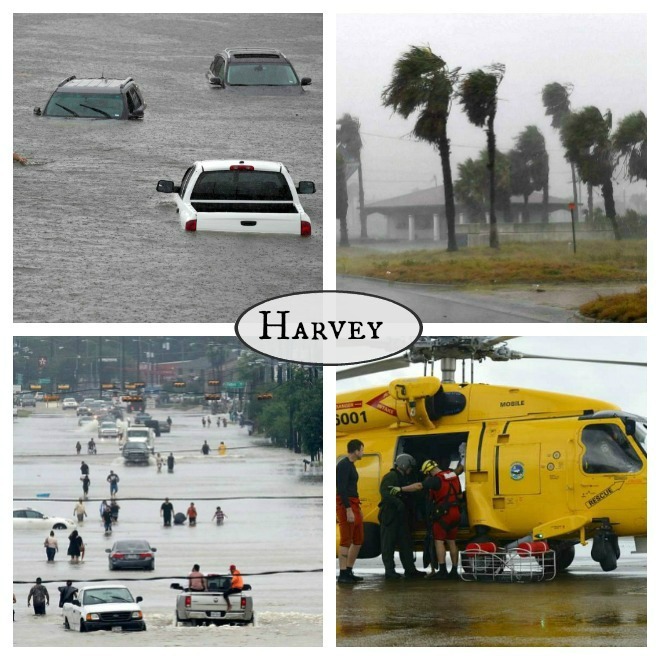 Harvey was just devasting, and they keep coming... while everyone was bracing in Florida the views were coming out of the Caribbean. While I do agree that there is a big problem with the media, has been for some time, I think that we each have to find the right way to get the news we want. Some journalists/sites are better than others. We used to get whatever came on the local stations... now... it's everywhere at our fingertips. I might read one site for a while and find the content changes or I don't like where they go with certain stories, so I move to another one. I do hope the higher consciousness you spoke of can continue... however, I'm questioning so much right now I just don't know where we all are collectively. Sad, I know. Guess I'm a debbie downer today eh? Yes, it's incredible how devastating Harvey was. It broke my heart to see what the people of Texas went through. I have many family members and friends in Florida, so I was VERY concerned and worried. I kept in contact with them throughout and was relieved to hear that where they were, the damages were minimal and they didn't lose electrical power.
" 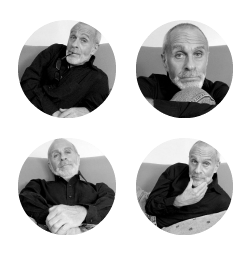 I might read one site for a while and find the content changes or I don't like where they go with certain stories, so I move to another one." Yes, you're right we do have choices as to which journalists we tuned into, however, (and this is just my observation) they have ALL eventually turned into a shouting match, and quite frankly, I'm sick of it because it's all for drama and ratings. Other than the weather, I've pulled myself away from watching the news. "I do hope the higher consciousness you spoke of can continue... however, I'm questioning so much right now I just don't know where we all are collectively." I know what you mean because it's hard to see a higher consciousness with all the chaos going on, not only the in US, but all over the world. Yet, I think something such as devastating as Harvey, has snapped many of us to attention; noticing what our true nature is - to reach out and help others and that we are all the same. Wow! Those were some heart grabbing photos Ron. What you say is so true. Even while watching the news relating to Harvey, there was a singular thought gnawing at me from the back of my mind. That thought was related to climate change. It is clearly changing, yet some people still deny it. More storms, stronger storms, rising temperatures, rising sea levels, etc. I absolutely LOVE how you said that because you are spot on! Thanks so much for stopping by and sharing your insight, my Libra friend! You're so right, Pat, it is clearing changing. And has been for the past 10 years especially.